This memorial park was commissioned in 2007 to replace a car park. The design reconciles the dramatic level changes and layout of large rock floaters, by inserting a series of concrete steps, seats, walls and terraces that afford passage down the site and creating a place to enjoy the panoramic views. The viewing place is formed by an arrangement of lookouts and seats at the top of the site. Blue glazed bricks line their solid concrete form. Like little concrete tiaras sitting on the stone bedrock, the lookouts reinforce the iconic nature of the place and the singular quality of the views. An explicit connection with the blue light of the sky and sea is forged. The park now forms an important link between the beach and the coastal cliff walk. The design has been awarded the urban design and architecture awards from both AIA and AILA. More information on Ben Buckler Point. Lloyd Kelemen worked across multiple public art projects in the 1980s. His mosaics feature in the Biddigal Reserve playground, North Bondi Children’s Pool, Bondi Pavilion, Bronte Park and Campbell Parade. Here, he creates a series of bright and fantastical creatures for children who use the park. It is a little known fact that when the mosaic fish was a steel frame (prior to concrete and tiling), it was stolen from Kelemen's studio at Addison Road. A few months later, a friend of the artist spotted the large steel fish frame in a Surry Hills backyard. Kelemen visited the home multiple times to retrieve the large fish but sadly the owners were never home. He then 'reclaimed' his fish, made finishing touches where it was then positioned in Biddigal Reserve where it remains today. The theft was even discussed on JJ radio (as it was then known) when the Surry Hills home owner phoned in to complain that someone had stole his large fish from his backyard! Peace Mural is one of a series of three banners painted during a community artist in residence at the Bondi Pavilion in 1986. The artist worked with different community groups to develop a banner with themes to encapsulate 'Their Bondi'. Commissioned in 1999, these items of street furniture are designed to reflect Bondi’s culture and heritage. The mosaics show the natural environment and the area's distinctive beach lifestyle. Depictions include the famous Bondi lifesavers in their original uniforms, surfers riding waves, brightly coloured kites from the popular Festival of the Winds, the renowned Bondi Tram (which coined the expression 'shoot through like a Bondi tram') and the arches of the Bondi Pavilion. 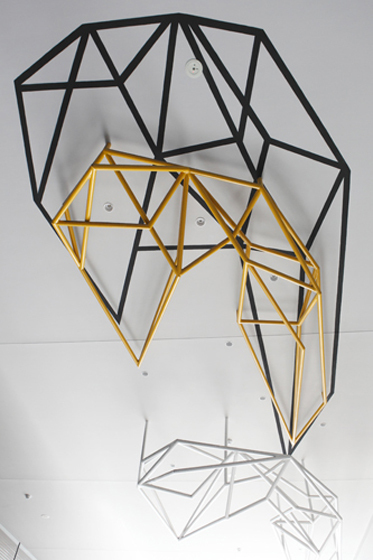 The southmost yellow items of street furniture were created by Lloyd Kelemen and acted as a structural prototype for the rest of the series. The Time Walk 2000 combines a varied and disparate range of Bondi images which, when experienced during a walk along Campbell Parade, form a net of shared experience of place - Bondi. The artists – Fiona MacDonald, Kath Grant and Melanie Cariss address the importance of Bondi as a national symbol, combining nature and culture. 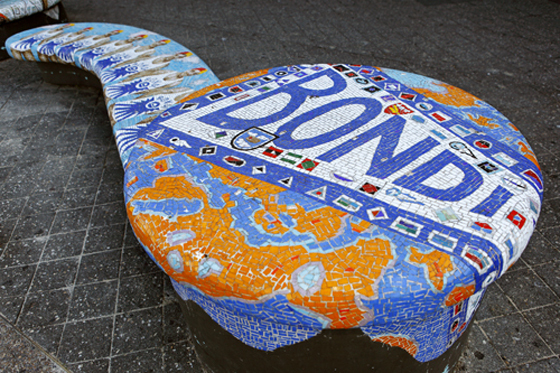 The rondels placed in the pavement each show an aspect of Bondi's colourful heritage and beach culture. Basalt and sandstone were chosen for the rondels because they both occur locally. Campbell Parade is built over part of a road that previously led to a former basalt quarry and before this, the indigenous community utilised the basalt as a material for creating tools. The work also uses materials relating to the geology of Bondi: sandstone and blue stone, which make up the substratum of the area. Glass and stainless steel introduce culturally produced elements. These materials carry images and text that refer to the iconic position of Bondi as well as its ‘lived in’, everyday reality. Research both within the community, as well as local, state, public and private archives, produced a wide variety of background information relating to four broad categories: pre-contact and indigenous sense of place; play, leisure and the lifesaving movement; work, industry and the environment; people and communities. These themes are all underpinned by one constant, the nature of the place; its geography and climate. The emphasis of the art work is to capture the relaxed atmosphere of Bondi and this is evident in the playful juxtapositions of themes and materials. 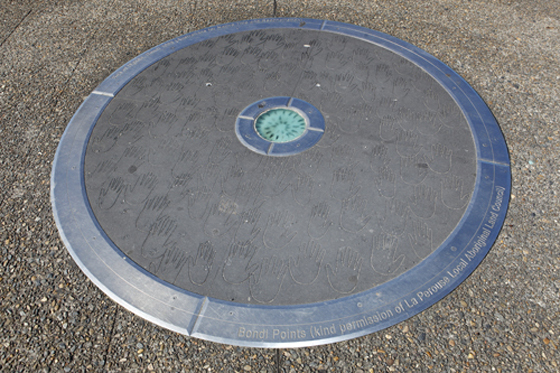 Priority in the selection for the completed roundels (from 32 designs) is given to subjects that span a broad cross section of the material available: the earliest being the Bondi points and rock carvings, and the most recent is the installation by Australians for Native Title and Reconciliation of Sea of Hands on Bondi Beach in 1998. Other images portrayed in the rondels include swimmers, lifesavers, lifeguards, beach goers and the sea. Sharks are featured as a presence at the beach. The fear of shark attacks grew out of proportion compared to the actual risk of attack which fuelled campaigns to have sharks eradicated. One of the rondels shows Jack Platt, the famous shark fisherman. Another rondel depicts the quirky image of Princess Margaret's sandaled feet taken on the 1975 royal visit to Bondi. Steven Russel is a Bidjigal weaver, drawer and painter who was born and raised on La Perouse mission in Sydney. He comes from a long line of celebrated La Perouse shell workers, particularly Esme Timbery (father) and Queen Emma Timbery (great, great grandmother). 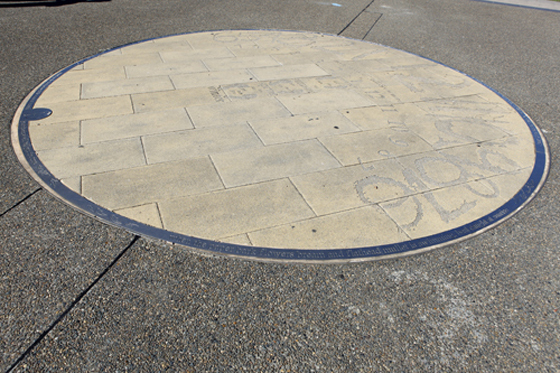 The Human Sundials were commissioned in 2008 as a part of Waverley Council’s ongoing commitment to conservation of Waverley’s Aboriginal cultural heritage. Steven Russell provided the drawings, knowledge and language for a sundial and steel disks incorporated in the Campbell Parade East footpath. These portray stories relating to Koori time and seasonal harvest. Now based in Gerringong on the New South Wales South Coast, Steven Russell works in local schools and communities, and runs an artist collective, Jungah Weavers, with his wife Phyllis Stewart, who is also an artist. New Zealand sculptor, Terry Stringer has been nationally celebrated as an Officer of the New Zealand Order of Merit. Terry Stringer has completed a number of major commissions throughout New Zealand, and his artworks are held in collections across Australia, New Zealand and the United Kingdom. In the late 1970s he was awarded the prestigious Queen Elizabeth II Arts Council Scholarship three times. He is a key figure in the history of art in New Zealand, a sculptor with an established reputation. Stringer generally works in bronze and is known for his iconic style of the sculpture in the round. These works transform from one image to the next as you move around them. More information on Terry Stringer. 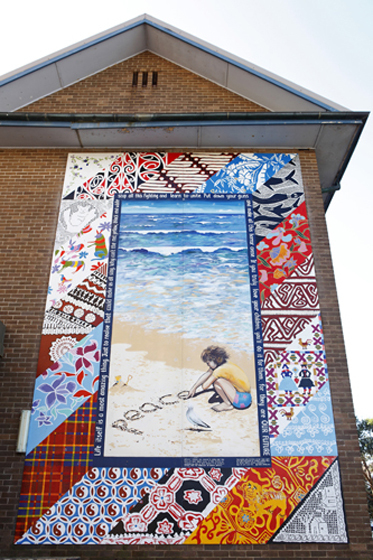 This mural at Chapel By The Sea celebrates social justice for indigenous Australians. 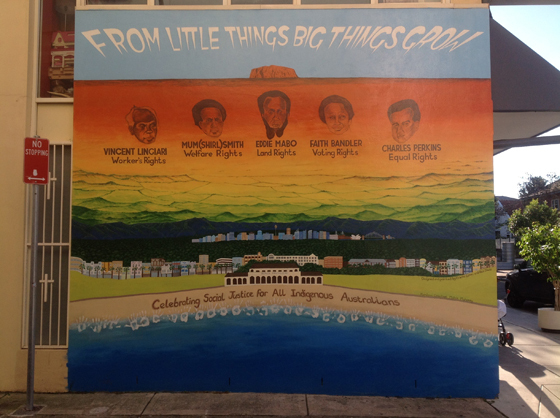 The mural recognises five leading figures in the struggle for indigenous recognition at a constitutional level. The launch was timed to be in conjunction with Australia Post's release of a stamp series for NAIDOC Week 2013 honouring indigenous elders. This mural is the third in a series of social justice murals supported by Uniting Churches, the others being I Have A Dream in King St, Newtown and the Peace Justice and Unity murals in Sydney’s CBD. This piece was selected from a competitive tender process through Toga Group for Hall St's recent development, Bondi Boheme. Dion Horstmans was born in Wellington, New Zealand and moved to Sydney in 1989 to follow his interests in film and design construction. He has been exhibiting professionally since 1995. His works are held in both public and private collections nationally. Exhibiting in galleries and art fairs both in Australia and internationally, Horstmans is a regular exhibitor in Waverley's Sculpture by the Sea and has also been featured in Vivid, Art Basel and multiple public commissions. In Hortsmans abstract geometric constructions, he often plays with defining space and manipulating shadows in order to create new and exciting environments in the public realm. More information on Dion Horstmans. Embedded into the mosaic furniture are unique steel arm rests. They swirl and undulate like a wave in motion. Similarly, the traffic rail adjacent to Lamrock Avenue has been inspired by the movement and gestures of waves. Chris Rak has over 16 years experience in creating medium to large scale sculptures for both the private and public sector. Chris has studied both sculpture and interior architecture. Chris says his passion lay in the challenge of achieving a harmonious relationship between object and space and witnessing the ongoing transformation and experiential qualities they share. 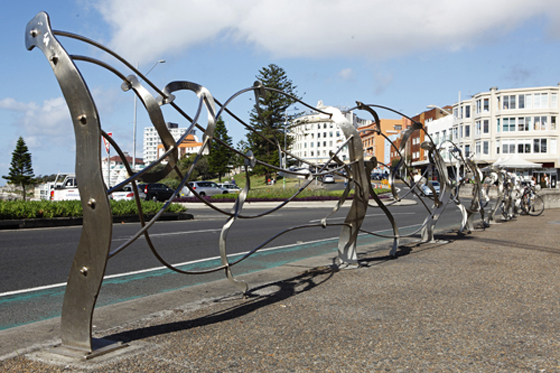 Chris regularly collaborates with other artists including his wife, Kathryn Robson and the artist behind Bondi's mosaic street furniture, Helen Bodycombe. More information on Chris Rak. 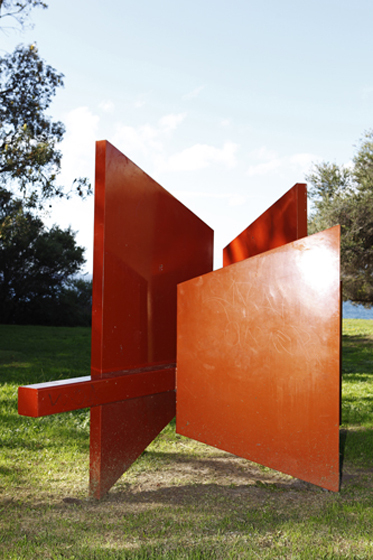 Acquired through an acquisitive prize from Sculpture by the Sea in 2002, Linda Bowden's View with a room is an example of steel formalist sculpture. This particular piece is an interpretation of the artist’s domestic surroundings through abstracted forms and planes. Linda describes the work as "an abstracted version of a room with four walls and the strong horizontal line being the floor line of the room." More information on Linda Bowden’s sculpture. Donated by the late artist’s family after his death, Stickman was the first sculpture placed in Hunter Park. The artist, Paul Milman was a local artist who worked both in Australia and overseas. Sasha Reid's Life of the beach is inspired by the line of a lifesaver's reel and marks a century of the Surf Lifesaving Association. 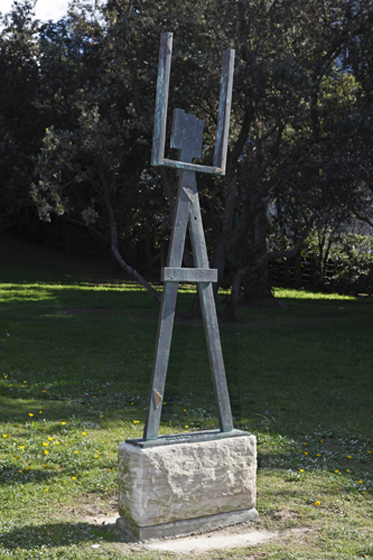 This piece was acquired after being exhibited in Sculpture by the Sea in 2007. Sasha has worked in a range of materials specialising in site specific installations with environmental concerns. He is interested in our reactions to the landscape and the history of our interactions with it, in particular the way we have used tools to change and remake the environment. More information on Sasha Reid. Chapel for Sydney was created by Czech artist, Vaclav Fiala. 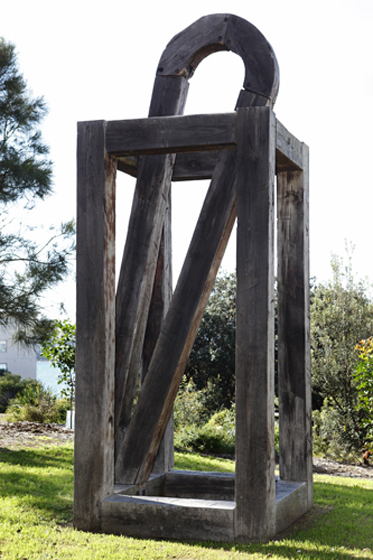 The 5.5m high sculpture was acquired through the Lexus Prize for Sculpture in 2005. 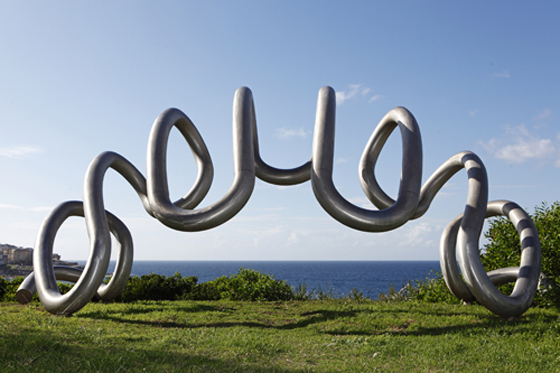 It was his second win of a major prize in Sculpture by the Sea. Vaclav has an extensive international career and works in a variety of mediums including stone, wood and iron. His sculptural approach is based on the reduction of shapes and is often inspired by architecture. More information on Vaclav Fiala. Street art has always been a part of Bondi’s youthful and vibrant identity with many major street artists living and working in Bondi. 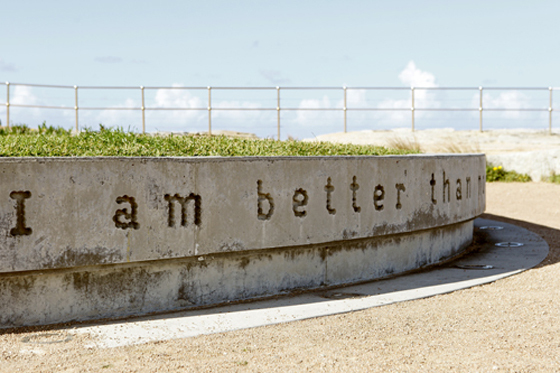 The Bondi Sea Wall is an evolving site where artists are welcome to leave a temporary mark on Bondi Beach. More than 200 people, including 88 Australians, were killed in the bomb attack at the Sari Club, Kuta Beach Bali, on 12 October 2002. One victim was Bondi local, 15 year old Chloe Byron, on holiday in Bali with her family. The ‘girl with the frangipani in her hair’ grew up on the beach at Bondi and was widely known through her active participation in many local sporting clubs. She surfed longboards with her dad, David Byron, off the third ramp at Bondi, on an 8 foot board she ‘borrowed’ from him. 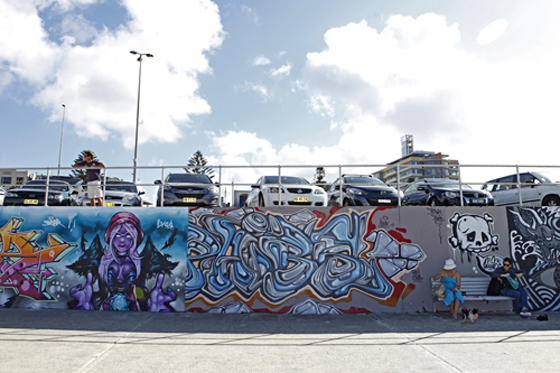 In 2003, with the support of Chloe’s family, local aeorosol artists led by Droogie painted a memorial mural for Chloe at the third ramp on the Bondi Sea Wall. Over the years since it was painted, the Chloe Memorial Mural has become a beloved part of the Bondi landscape. Incorporating a portrait of Chloe, along with elements of beach culture including a view of Bondi Beach, a longboard and frangipani flowers, the mural captures and reflects back elements of the active beach culture that was such an important part of Chloe’s life as she grew up in Bondi. Droogie has repaired the mural multiple times since 2002 with Waverley Council funding its restoration in 2012 for the 10 year anniversary of the bombings. Around the time girl with the frangipani in her hair was being painted, Droogie was also working on an ANZAC mural. The artist painted it using a picture given to him by an old Bondi Digger. The murals, along with girl with the frangipani in her hair were endorsed by Council for long term preservation in 2009. 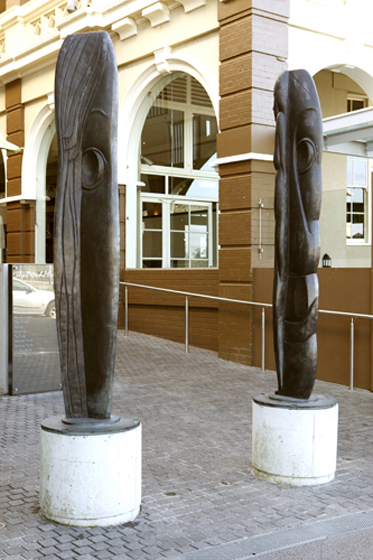 In her late career, Diana Webber became a well regarded sculptor completing public commissions across New South Wales. She was also commissioned to design the trophy for the Cultural Affairs Department for the Australian and French Rugby. These commissions were executed from her home foundry, situated behind Campbell Parade. 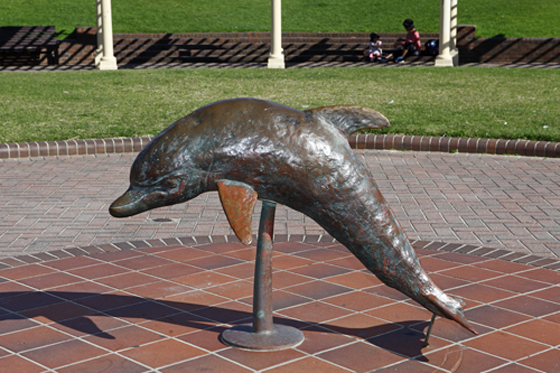 Similar to her Bronze Surf Life Saver, this dolphin was commissioned as a bicentenary project and created from Webbers foundry. 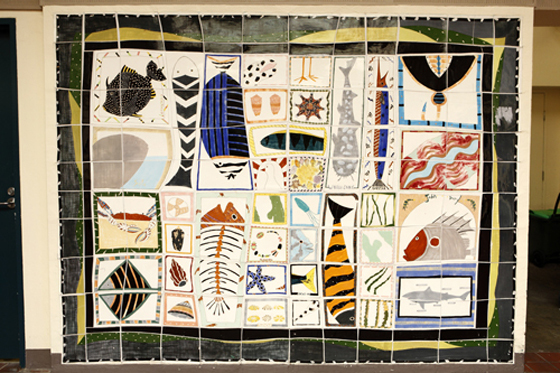 In 1984, botanical artists Helen Leitch and Patsy Hey were awarded a grant through the Australia Council to create a pair of ceramic murals in the artistic hub of the Bondi Pavilion. They depict local sea and plant life. 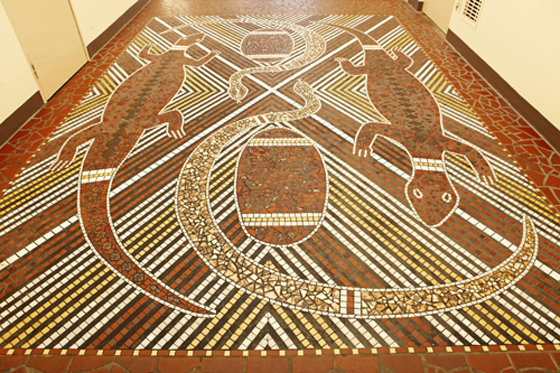 This work appears to be the first example of an indigenous mosaic in Australia. The collaboration between Kelemen, Robson and Yumbulul occurred after Yumbulul, an artist from the Northern Territory, exhibited in the Bondi Pavilion Gallery. Working through a translator, the three artists shared stories, knowledge and techniques. 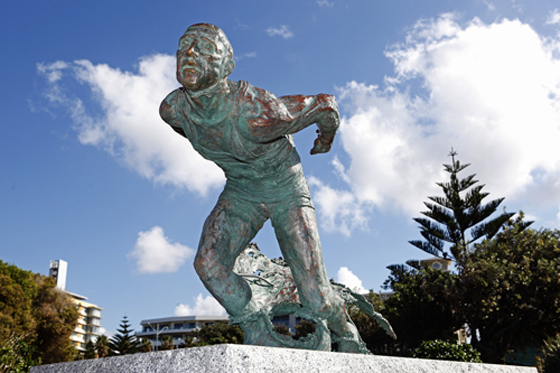 The piece was designed to recognise the original inhabitants of Bondi. Yumbulul had never worked with mosaic before and continued to use and share the new style and technique in his home community after the commission. 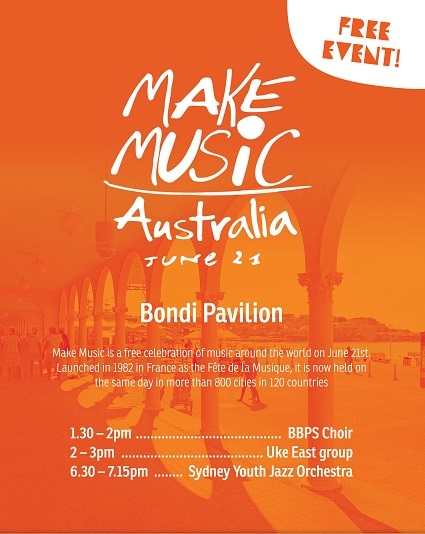 Bondi Pavilion Gallery is a creative hub for the community and visitors to Bondi Beach. Located in the iconic, heritage listed Bondi Pavilion, the gallery hosts an international audience with visitors from all walks of life. Boasting enormous visitation with an accessible attitude to audience development for cross section arts practices, Bondi Pavilion Gallery is a creative hub placed on the foreshore of contemporary Australian culture. For information about the current exhibition or how to exhibit your artwork visit the Bondi Pavilion Gallery.